In this month's issue of Youth Today, Bill Treanor has written an article about the 10 year results of the 1997 President's Summit for America's Future, which gathered leaders from 150 cities and all living Presidents, to focus attention on the help needed by more than 13 million youth living in poverty. Bill's article can be found here. Bill points out that the America's Promise organization, which was established to implement the goals of the Summit, has raised more than $27 million since 1997. The question is what has been accomplished other than creating high paying jobs for the staffers at America's Promise? I was one of Chicago's ten delegates. The Tutor/Mentor Connection was one of 50 organizations from around the country invited to have a display at the Summit, as a "teaching example". I still have newspaper articles, and the manifesto listing the commitments to helping the most at-risk youth in America. As a leader of a youth serving agency in a big city, I left the Summit hoping for reinforcements. I know how small non profits struggle for resources to keep youth and business volunteers coming to non-school programs, and how difficult it is to influence aspirations of education, college and careers, when these aspirations are not modeled by many of the most visible people in high poverty neighborhoods. I was hoping that General Powell would use maps, and be recruit business and celebrity leaders, who will mobilize resources to support the non profits already on the battlefield in our war against poverty. Instead, the war profiteers are those with high paying jobs, or who are earning big PR contracts. The troops are under-supported. The claims of success are over stated. As America's Promise itself reports in a 10 year report (no longer available online), there's much to do. If you want to be part of the solution, and a general in this war, I encourage you to attend the Tutor/Mentor Conference in Chicago on May 17 and 18, or send a "get it done" representative. On his Wrythings blog, Michael Maranda picked up the baton on the Olympic Gold medal concept that I wrote about last week. This illustrates what happens when a network of bloggers pick up an idea that they each share ownership with. It's like a long relay race, with many people carrying the baton at different times. Michael is one of several bloggers who I've met in the Omidyar.net forum. The Chronicle of Philanthropy's Give & Take Blog wrote about my recent Olympics Blog titled, "Do they give Olympic Gold Medals for Ending Poverty". I'm not really critical of Chicago competing to host the Olympics. In fact, I'm really happy. Every time a story is written about how some athlete is working so hard to win an Olympic medal, it will give me the opportunity to call on business, foundations, media and civic leaders to work just as hard to support tutor/mentor programs that connect inner city kids with adult tutors, mentors, coaches and learning opportunities that help them stay in school and move to jobs and careers. Maybe we can get the media to profile corporations, businesses and volunteers who are working just as hard to end poverty as these athletes are to win Gold medals. Illinois ranks 29th in adult volunteering. Can we change this? This is National Volunteer Week in America. All across the country volunteers are being recognized for the service they give to their communities. As the leader of Cabrini Connections, a volunteer-based tutor/mentor program, I am deeply grateful for the many volunteers who share time and talent to help us mentor kids through school and to careers. This week the Corporation for National and Community Service released a report showing volunteer involvement in Illinois and other states. This is one of many resources that the Corporation offers to help states and communities increase volunteer involvement. Illinois ranks 29th in volunteer involvement and 38th in measures of civic engagement. As a leader of volunteerism in Illinois, and as the leader of the Tutor/Mentor Connection, I want to see us do better than ranking 29th in measures of volunteer involvement, and 38th in civic engagement. In May the Tutor/Mentor Connection will host a leadership conference in Chicago. Our aim is to share ideas that can help tutor/mentor programs recruit volunteers and donors. We want to extend an invitation to participate to the leaders of volunteerism in business, hospitals, universities and faith communities. If business leaders become more strategic in how you encourage volunteerism and philanthropy, you can do more to help tutor/mentor programs get volunteers than the programs can do to help themselves. If we can build the connection between business and volunteer-based tutor/mentor programs, we can create a pipeline that leads more kids from poverty to jobs and careers. If we do this creatively in Illinois, and consistently for many years, we can be NUMBER 1 in this important ranking of volunteer involvement from state to state. Hurrah! Chicago won the right to compete with other cities around the world to host the 2016 Olympics. What do these cities have in common with Chicago? They all have neighborhoods with high concentrations of poverty and disenfranchised youth. They are all seeking ways to prepare their youth for 21st century jobs and careers. So I propose that a Gold Medal competition be established to see which city can do the most each year from now until 2016 to build comprehensive, volunteer-based tutor/mentor programs in all of their high poverty neighborhoods, which are funded by the businesses who will get rich off of the Olympics, and who also are pointing fingers at public education because it's not doing enough to prepare low income youth for 21st century jobs and careers. There could be one winner each year from now till 2016 and a grand prize winner at the 2016 Olympics. Maybe this will become a tradition and will continue until the 2116 Olympics. What would the world look like then as a result of such a focused effort in cities all over the world? I just wish as many smart and powerful people in Chicago were focusing on the goals of the Tutor/Mentor Connection, as are focusing on getting the Olympic bid. Where do you start learning about ways to compete for this award? Come to the Tutor/Mentor Leadership Conference on May 17 or 18, which will be held in Chicago. Or visit the T/MC web site and begin to use the links and forums for your own learning and collaboration. You can even take a leadership role now, by using your blogs and your own media and web sites, to point your customers to the conference. Read how the Pew Foundation's Smart Communities blog is pointing their readers to the T/MC conference. PS: So far there is no Olympic Medal for Best City in ending Poverty. If you'd like to become a sponsor and partner to create such an award, email tutormentor2@earthlink.net, or come to the conference. Their focus was on what colleges and universities can do to change this and their solutions ranged from better training of teachers, to lowering the costs and/or increasing scholarships so more low income students can assess higher education. One even suggested that universities cooperate with each other as a way of lowering spiraling expenses of higher education! Another suggested that universities walk the talk of community involvement and community service, becoming institutionally engaged in solving the problems facing communities. On Friday, I attended a breakfast hosted by the Community Renewal Society. The purpose was to launch the Children of the Incarcerated campaign, which is intended to develop public policy initiatives that address the needs of children with incarcerated parents. The speakers were politicians such as Illinois State Senate President Emil Jones and Congressman Danny Davis. They were ministers, and people who have first hand experience working with children who have parents in jail or prison, or on probation. The statistics this group quoted were different from the ACI forum. Illinois currently pays $70,000 per year to incarcerate a minor and $22,000 per year to incarcerate an adult. As of August 2006, there are close to 90,000 children in Illinois with parents in jail or prison or on probation or parole. There is no system to track these children to know who or where they are. There is a lack of information about services. There are a lack of programs where kids can get social and emotional help and there is a lack of coordination of services. Yet everyone agreed that without social and emotional support, including mentoring, a high percentage of the children of incarcerated parents will end up being involved with the justice system themselves. Two meetings in two days and the audiences are worlds apart. What frustrated me most is that while both hosting organizations recruited participants via the Internet, neither has developed an on-line attendee list such as what we’re using for the May 2007 conference, that would enable the people in either event to connect with others attending the event, or to connect with others who attended some other event that focuses on the same issues. I've written about this before. Thus, we leave the meetings with new encouragement to do something, but without the connectivity that would enable more of us to connect, discuss the information, and put the ideas to work in our own organizations. My final meeting was with a senior at Northwestern University who is interviewing for a fellowship. His essay started with the statement, “If you want peace, work for justice.” (Pope Paul VI). The meetings I attended this week showed why we need to be more innovative on ways to reach young people living in poverty. If you want justice for all, I encourage you to become involved in organizations that are working to help youth move from poverty to careers. Recipe for Success – Who’s in Your Kitchen? Are you developing a program to help kids in your community? What’s your recipe? Do you have all the right ingredients? Who’s helping you? Who are you learning from? Read on if you’re concerned about the way your state is helping poor kids in your community move through school and to jobs and careers. The chart at the left illustrates four issues that each have an impact on the nation’s ability to reach youth living in high poverty neighborhoods and help more of these kids grow from first grade into jobs and careers. For instance, we may all want to reduce drop out rates, or increase the number of minority men and women entering careers in law, medicine, engineering and the sciences. But do we have a DISTRIBUTION of programs reach kids in poverty neighborhoods? Do we start these programs when kids are just entering school? Do we keep them going, with age-appropriate learning supports and career focused mentoring? Do we build student aspirations? Do we connect kids with men and women who can mentor the excitement and opportunities of these careers on an on-going basis, then open doors to scholarships and jobs? We all want better educated kids, but the No Child Left Behind (NCLB) program focuses primarily on test scores, not the additional learning and enrichment and social/emotional support that many kids living in high poverty neighborhoods need. Following the lead of NCLB, donors are looking for test score evidence from youth mentoring and youth development programs. Furthermore, many of the advocates for a system of learning supports are still only focusing on the school as the place kids connect with mentors and extra learning. Why not use the non-school hours are another channel of learning and enrichment. 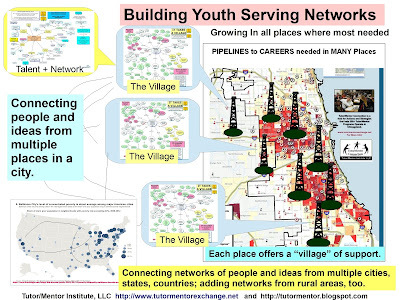 In big cities like Chicago, this is perhaps the most likely time when a busy business volunteer will make a long-term mentoring connection with a youth living in a poverty neighborhood. Finally, we can’t have good programs in all the places we need them with the current level of FUNDING and the current focus on project funding vs. program and operations funding. The Chicago Community Trust and the United Way of Metropolitan Chicago produced a report for the Chicago region that highlights the struggles of health and human service agencies. These are the same struggles of volunteer-based tutoring/mentoring programs that operate in the nonschool hours. You can find other articles on the funding challenges facing non profits in the T/MC library. 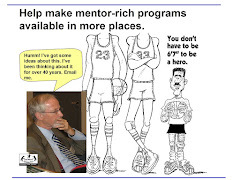 Every time you visit a Tutor/Mentor Connection web site, or look at one of our maps or graphic illustrations, we want you to be thinking of the many different ingredients that go into the recipe for helping kids in poverty grow more successfully from first grade to first job and a career. This is a conversation that needs to be taking place in thousands of circles. In businesses, universities, hospitals, k-12 schools, and in churches and political organizations. In truth, we know these are taking place. However, the T/MC goal is to connect these conversations, just like we combine butter and sugar with other ingredients to make cookies. We can make some of these connections at face to face conferences. However, the only way to keep these connections growing, and to keep learning from all of the research that is being generated each year, is to build our connections and learning on the Internet. This way we can learn and collaborate with people in other cities and countries, not just our own neighborhood. Who’s in your kitchen? How are you connecting different stakeholders in your own community? Can you connect your network to the T/MC, via the May and November conference, or the T/MC web site? In this Blog I’ve linked to sections of the http://www.tutormentorconnection.org/ web site with articles on each of the key issues that we need to understand, discuss and innovate new ways of doing the business of helping kids grow up and become part of the 21st century economy. In 2006 The Chicago Community Trust and United Way of Metropolitan Chicago co-sponsored a study to assess the current condition of the Health and Human Services system in the Chicago region and to assist in the creation of strategies that could address our greatest challenges facing the sector. Both organizations are concerned about the many strains on the Chicago metropolitan area's nonprofit health and human services (HHS) system, caused by dramatic demographic changes in the region, growth in the need for services and at the same time increasing uncertainty about adequate funding. I encourage Tutor/Mentor Connection supporters to read this report. Every issue described in this report is a challenge facing volunteer-based tutor/mentor programs in the Chicago region, and probably in every other major city in the country. The Tutor/Mentor Connection has been focusing on these issues for the past 14 years, in its efforts to help small and mid size volunteer-based organizations throughout the Chicago region get the consistent resources they need to keep leaders and develop quality programs. 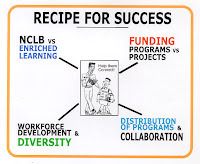 In the LINKS sections of the T/MC web site we provide numerous links to articles that illustrated the funding challenges we face, as well as articles that show why non-school tutor/mentor programs are critically important to school reform, workforce development, etc. The May and November Conference is an invitation for people who are concerned by the issues raised in the current report produced by the Chicago Community Trust and the United Way of Metropolitan Chicago to come together to talk about these issues, expand your network of supporters and peers, and look for ways to innovate solutions that distribute volunteers, operating dollars, and leadership more consistently into more places. I did a quick concept map today to illustrate the different workshop and speaker expertise that will be represented at the May 17 and 18 Tutor/Mentor Leadership Conference in Chicago. If we're talking about helping kids from poverty reach jobs and careers we should be learning from workforce development, or diversity pipeline experts. We should be learning from college and career networks. If we want to build more and better volunteer-based tutor/mentor programs, who better to learn from than people who lead such programs, such as the Big Brothers/Big Sisters of Metropolitan Chicago, or Chicago Youth Programs, Inc. If we want to learn ways to evaluate programs, why not learn from the YMCA of North Lawndale, or Highsight? The May and November Conference draws attention to volunteer-based tutor/mentor programs and enables participants to expand their network to include people and organizations who approach youth development from different perspectives, such as violence prevention, or academic tutoring, or mental health. You can expand your network by participating in the conference. You can stay connected to this network by participating in on-line forums, blog exchanges, and other on-line learning and networking strategies. It really does take a village to raise kids. In poverty neighborhoods we need to expand the number of partners from business, faith communities, philanthropy and higher education who are working with schools and community based tutor/mentor programs. We need to learn from others to better understand the challenges poverty puts on education and familes. Map your own network and compare it to the concept map above. Are you learning from this range of people as you map your own strategies for workforce development, or workforce diversity? Maybe you should come to the conference in May and share what you know as you expand your own network. The agenda for the May 17 and 18, 2007 Tutor/Mentor Leadership and Networking Conference is now posted. Arne Duncan, CEO of Chicago Public Schools will be one of the keynote speakers. A team from the University of Toledo will talk about it's journey in planning a new mentoring strategy. A panel on violence prevention will talk about issues of young men who are between 16 and 30 and out of school, and unemployed. Take a look. We hope you'll plan to attend.